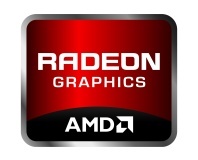 Sapphire has announced the first AMD Radeon HD 7000 series graphics card to include its FleX technology for three-way Eyefinity out of the box. The Sapphire HD 7950 FleX Edition 3GB becomes the company's most powerful FleX-enabled graphics card to date, bringing the multi-display technology to the Radeon HD 7000 family for the first time - along with boosted clocks of 860MHz core and 1,250MHz memory for the performance enthusiasts. FleX, for those who haven't come across it before, it Sapphire's solution to the problem of out-of-the-box Eyefinity support. A reference-design Radeon HD 7000 board typically requires at least one monitor in a three-way Eyefinity single large surface (SLS) setup to support DisplayPort. With that still being a rare sight on consumer-grade kit, many gamers turn to active DisplayPort to DVI or HDMI adapters - additional expense on top of the cost of the card. Sapphire's FleX aims to alleviate this issue by providing a pair of DVI ports and an HDMI port on the card, along with a bundled HDMI to DVI passive adapter. The result: a board which is ready for a three-way Eyefinity setup with affordable DVI monitors straight out of the box. As well as bringing FleX support to the Radeon HD 7000 series for the first time, the board also features Sapphire's latest cooling system. Dubbed Dual-X, the custom cooler features a set of heatpipes in carefully graduated sizes, designed to evenly distribute the GPU's heat output across the heatsink. Two aerofoil fans with dust-repelling bearings provide the active cooling, with Sapphire claiming particularly quiet performance even during extended gaming sessions. 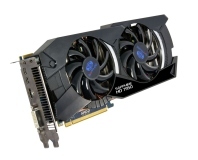 The Sapphire Radeon HD 7950 Flex Edition 3GB is appearing in the UK sales channel now, with the cheapest price at the time of writing provided by Kikatek at £328.96 delivered. Following on from the HD 7970 3GB GHz Edtion, AMD gives a boost to the HD 7950 3GB too. Details regarding the rumoured AMD Radeon HD 7990 dual-GPU card have leaked ahead of launch.